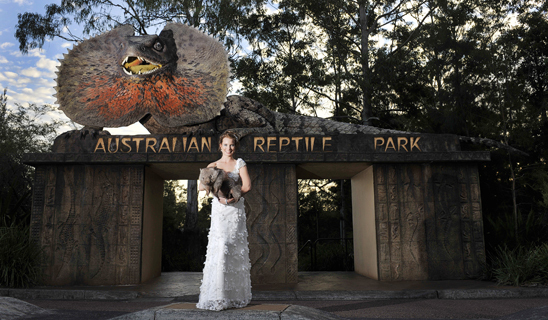 The Australian Reptile Park at Somersby is now a Central Coast wedding venue and a great place for your wedding photography if you are into…. reptiles. Actually, there’s lots more to the park than just the animals, although they are a terrific drawcard. There is plenty of bushland, grassed areas and forest trails that are perfectly suited to beautiful wedding photos. Last week, I was lucky enough to be invited by Kel of Kel Leigh Couture to capture some images of her new bridal gowns at the park. What a fun shoot! The park was open to visitors and although Vanessa, our gorgeous model, was drawing plenty of attention, it wasn’t difficult to make it look like we had the entire park to ourselves. The shoot was collaborative for the Reptile Park and Kel where the aim was to showcase both the beautiful gowns and the wildlife. 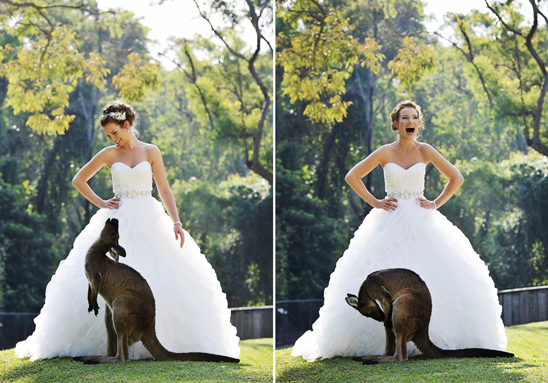 The photos you see below are exactly what any bride can have if planning their wedding at the Reptile Park. All photos were shot in the same areas that are available to the public under the instruction that what we showcase must be available to any bride planning a wedding on the grounds. Obviously you’ll need to have an incredible gown, great make up and a damn good looking… photographer (joke). On the topic of makeup and looking good, special thanks has to go to Michelle from Heavenly Hair and Makeup who did an amazing job for this shoot. If you are thinking of a Central Coast Reptile Park Wedding, you’re probably wondering about a reception? Well, there is a perfect area between the rock wallabies, the Galápagos tortoise and the snake den for a marquee of any size. Bring in your caterers and you have everything sorted for the perfect wedding. I’ll add links and contact numbers to everyone involved with the shoot below, including the reptile park. Our first shot of the day was with a very frisky Skippy who definitely had the hots for Vanessa – so much so, he wasn’t the slightest bit embarrassed to look deeply into her eyes before having a little ‘play’. 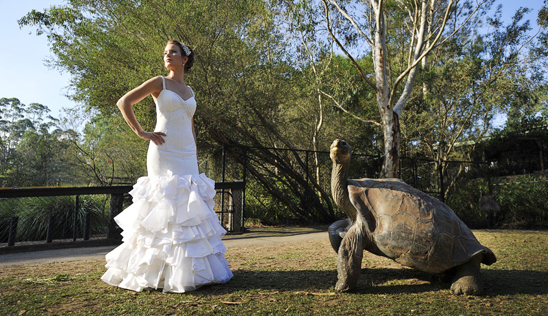 With or without animals, the Reptile Park is a fantastic location for beautiful wedding photography. I’m unsure who is the star of this shot! You’d think I’d be able to work slowly with a tortoise… not the case, this guy could really move and he had a serious beak too! This is one of our favourite images from the shoot – Vanessa, the gown, the location and the small garden snake all make for a wedding photo with a difference. 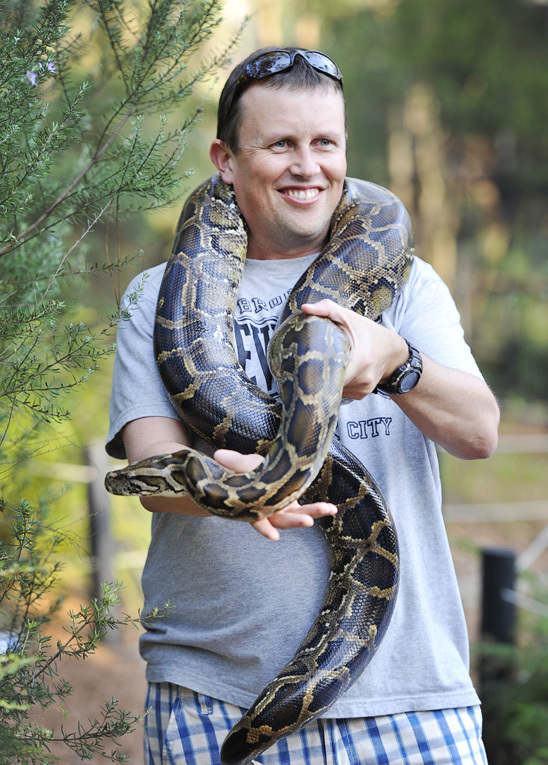 We were lucky enough to have Ian, a high profile overseas fashion model out for the shoot… Not really, meet Ian, Kel-Leigh’s husband who just had to get a hold of that snake. Although small, this alligator was feisty and gave Vanessa a good slap or two across the back with his powerful tail. All worth it though… How good is the light in this photo! We had to make sure we had the advertising/promo shots for the Reptile Park for their advertising and promotional material – hopefully you’ll see this and some of the other images in the future. My absolute favourite gown from the shoot. What a fun shoot and a real pleasure to work with everyone involved! If you are planning a wedding at the Australian Reptile Park, I can guarantee that you will be so well looked after and your day will be perfect. The team there couldn’t do enough for us and their love for the park and animals was obvious and infectious. To find more information about having a Central Coast wedding with a difference, contact Jane at the Reptile Park on 4340 1022. For a marquee, The Party Hire Co are simply the best. If you love the photos you see here and would like more information about our wedding prices, simply add your details to the form below and you’ll get immediate access to our complete wedding price list. I love this shoot! I don’t know if its just one single aspect that attracts me to it, but its definitely not the snakes! I really like the lighting and vivid colours, the images just pop. I think my favourite would have to be with the owl! Hey Matt – thanks so much for your comments, coming from another pro photographer, I feel flattered. I agree, the owl shot is my favourite too. Thanks again for leaving a comment.